The year 2006 was not my most exciting year which I have experienced until now. It was a colorless year which I can summarize in a few words, namely; F-16s, F-16s and even more F-16s. There was no time to go to other countries than Belgium and the Netherlands due to my final internship. This was not a problem, but I did not came further than the local F-16 basis in these 2 countries. The year 2006 brought me to one of my biggest milestones which I have reached. I switched completely over to digital photography since July. The end was there for me for era of the so-called analog film. My first brand new digital camera is the Pentax IST Dl. The only flying day during the exercise Ample Train at Volkel Air Base was on Wednesday, April 12, 2006. It was a long time ago that an exercise like Ample Train was held at this air base in Brabant. The main goal of the exercise is to train the ground personnel on different aircraft types within the NATO. The ground personnel are working during the exercise on the operational aircraft of the other NATO members. After one week, the crew chiefs are able to perform these basic operations on these various types. I went only one time to the head of the runway 28 at Gilze-Rijen in the year 2006. I had the chance to capture the first C-17 on photo which visited Gilze-Rijen. The C-17 came in to exchange the Apaches of the no 301 Squadron. 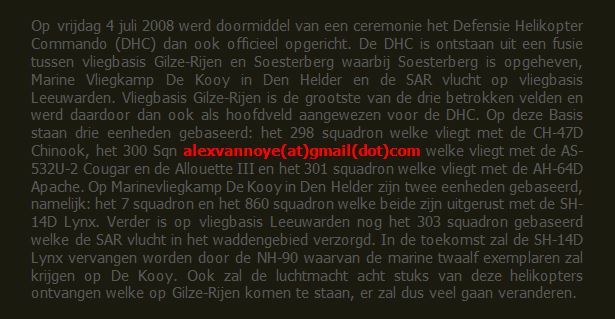 There are currently six Dutch Apaches at the Dutch detachment in Afgha- nistan. The helicopters are exchanged after a few months because they are in need of servicing. This C-17 brought two of them back to Gilze-Rijen. Also two other helicopters were pre- pared to go to Afghanistan, the weather during the departure was gray. At the Belgian air base Kleine-Brogel are currently three F-16 squa- drons stationed. The first two units have an operational role and the third unit has a training mission. The Squadrons at Kleine-Brogel, are; the no 31 Squadron, the no 349 Squadron and the OCU. The no 23 Squadron was disbanded on March 8, 2002. Kleine-Brogel Air Base was set up by the Allies in 1945. The 10 Wing was founded in December 1951, in Chièvres and consisted of 3 squadrons, namely; the no 23, the no 27 and the no 31 Squadron. Leeuwarden is the home base of the no 303 Search And Rescue (SAR) Squadron. The unit is currently equipped with the Augusta-Bell AB-412SP. These bright yellow helicopters are used for rescue missions and hospital transports in the Wadden area. One helicopter is standby at Terschelling for this duty every day. The SAR Flight received a new name in 1998. The unit was renamed from SAR Flight to no 303 Squadron. The primary tasks of the no 303 Squadron are to track and rescue people in the Wadden Area. The no 322 Squadron is the oldest F-16 unit of the Royal Netherlands Air Force. The history of the unit goes back to the Second World War. The no 322 Squadron was formed as the Dutch Spitfire Squadron. The mascot of the unit is the African Grey Parrot which is visible in the squadron emblem and on the F-16s. The no 322 Squadron was the first Dutch unit which shot down an enemy MiG-29 with the F-16. This Serbian MiG interrupted the allied actions in 1999. The J-063 has now a MiG-29 silhouette under the cockpit because of this incident. The second F-16 unit at Leeuwarden Air Base is the no 323 TACTESS Squadron. This unit was established in 1949 and is operating from Leeuwarden since the F-16 era. The emblem of the unit shows Diana, the Roman goddess of the hunt. The no 323 Squadron is the leading unit in the education of weapon instructors. The no 323 Squadron was renamed to no 323 "Tactical Training, Standardization and Evaluation Squadron” (TACTESS) on July 3, 1992. The unit is the school to train pilots as weapon instructors for the European Air Forces. From May 1, 2006 until December 7, 2006, the Fighter Weapon In- structor Training (FWIT) took place at Leeuwarden Air Base. The air to air phase is performed at Leeuwarden Air Base. This stage lasts from May 1 until July 21. On Wednesday, July 12, I attended this exercise during the phase in which US F-15s participate during the training. 10 F-15s of the USAFE from RAF Lakenheath are currently at Leeuwar- den for the training. 10 F-15Cs are here to act as an enemy during the examinations of the students. The first F-16s of the no 313 Squadron were moved from Twenthe Air Base to Volkel Air Base in months November and December 2005. Volkel Air base is the new home base of this unit since the start of 2006. Twenthe Air Base is after the departure of the last F-16s not longer an active base of the Dutch air force. The no 313 Squadron has the same operational tasks as the no 311 Squadron and the no 312 Squadron. The F-16s are used for both air defense tasks and air support tasks according to the so-called swing-role principle. The exercise HWIC Recovery took place at Gilze-Rijen Air base from October 16, until October 19, 2006. This extended exercise is an inte- grated exercise which is part of the Helicopter Weapon Instructor Training (HWIC). I was present at Gilze-Rijen during this HWIC exer- cise on Tuesday October 17, 2006. Helicopter crews of the Dutch THG-KLu are during HWIC trained for integrated cooperation between ground and air units. One of the exercises in this process is the exercise HWIC Recovery which is flow in the area around Gilze-Rijen.